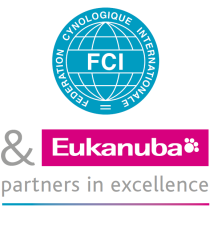 The 2013 FCI World Dog Show saw purebred dog enthusiasts from 5 continents, with some 18,000 dogs representing 371 breeds, descend upon the sprawling Hungexpo Fair Center in Budapest. Meeting held on Wednesday 24 April at the Museum of Hunting and Nature, and on Thursday 25 April at the head office of the French canine organisation (SCC). Every year, the German canine organisation - the Verband für das Deutsche Hundewesen (VDH) - and its affiliated clubs pay tribute to the role of dogs in society, honouring them with a "Dog Day". A new study of the registration figures of dogs of the world reveals that the Labrador Retriever is the most popular breed in the world, followed by the German Shepherd and the Poodle (all sizes included). The sky was grey and threatening for the Maurice BARCHY Grand Prix organised by the CNBCL AWANS – the only club in the Wallonia region – at its facilities in the rue J.L. DEFRÊNE in AWANS. Hounds were in the hands of kings and nobility and hunting was forbidden for the common people, in England and likewise in France, at the risk of being sentenced to death. Doglebrities : A must-see in Brussels: have you ever heard of the Zinneke? The World Winner competition 2013 in obedience once again showed that there is an increasing interest in obedience training and competing. Zadar is a small but very old town in Croatia, Dalmatia. Throughout the centuries, Zadar was almost completely destroyed four times. Spring equals international show season for the Norwegian Kennel Club, and the 4th and 5th international shows were hosted in Ålesund and Drammen, respectively. For more than 40 years International Dog shows have been held in Umag, in a small Istrian coastal town in the north of the Croatian Adriatic coast. The French Championships of pure-bred dogs organised by the SOCIETE CANINE REGIONALE MIDI COTE D'AZUR in collaboration with the Société Centrale Canine (French canine organisation) have taken place in a warm and summer-like atmosphere on June 1st and 2nd 2013.